1. I-153. Unit: 1st AE, 71st IAP, 61st AB, VVS KBF. Serial: 50. Pilot - Deputy commander of 1st Sqn Maj.Lt.Alexsandr Gerasimovich Baturin, Bychye Pole, Soviet Union, Summer 1942. 2. I-153. 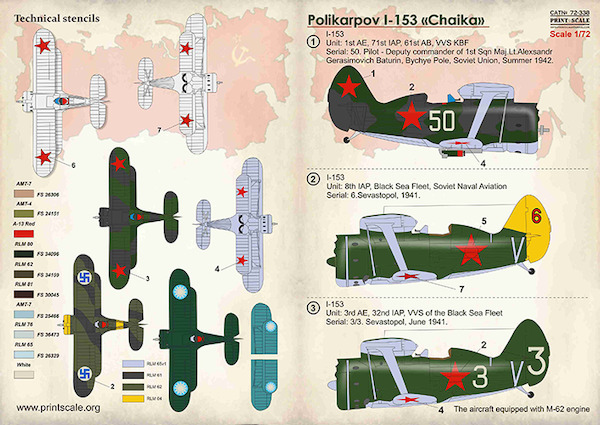 Unit: 8th IAP, Black Sea Fleet, Soviet Naval Aviation. Serial: 6. Sevastopol front. 3. I-153. Unit: 3rd AE, 32nd IAP, VVS of the Black Sea Fleet. Serial: 3/3. Sevastopol', June 1941. 4. I-153. Unit: 123rd IAP, 10th SAD. Serial: 2. This aircraft was captured by German troops at Bobruisk airfield in July 1941. 5. I-153. Unit: 70th IAP. Serial: 26. Pilot - assistant of AE CO Victor Gusarov. Nomonhan Conflict, October-November 1939. 6. I-153. Unit: 71st IAP, VVS KBF. Serial: 24. Pilot - Captain Soloviev Konstantin Vladimirovich. Spring 1942. 7. I-153. Unit: 71st IAP, VVS of Baltic Fleet. Serial: 102. Pilot - Capt.Solovjovin. Finnish front, 1942. 8. I-153. Serial: 16. I-153 assigned to a fighter regiment based at Minsk, Byelorussia on 22 June 1941. It was destroyed with the others Soviet planes on the ground. Uppersurfaces are green mottle over aluminum, while the undersurfaces are in blue. 9. I-153. Serial: 12. This aircraft took part into action at Finnish front in June 1941. After forced landing it was captured by Finns and repaired. It was used by FAF as VH-19 (IT-19) till February 1945. 10. I-153. Unit: JVS 3. Serial: 101. Vienna-Schwechat, 1942. The plane was used as an advanced fighter trainer. 12. I-153. Unit: 3 /LeLv 6. Serial: 8. This plane was flown by 2nd Lt Olavi 'Olli' Puro, 3./LeLv6 in November 1942. Puro claimed two victories while flying this aircraft: I-153 on 4 October and Pe-2 on 12 November 1942. 13. I-153. Unit: 3/LeLv 6Serial: 6. Pilot - Kapteeni Per-Erik Ahonius, CO of 3/LeLv 6. Rompotti, USSR (now Russia), July 1942. 14. I-153. VH-12 was captured and flown by the FAF. The aircraft was lost when it crashed, due to an engine fire, near Someri Island on 9 July 1942. Soviets or bought from Germany. White 5 is seen here as it appeared on 30 October 1942 with olive drab and black/green uppersurfaces over RLM65 bottom. 16. I-153. Unit: 27 Sqn. Serial: 2706. China, early 1940.